Rex P. Malone, 91, of Odon, passed away peacefully Tuesday, May 15, 2018. at Ketcham Memorial Center with his brother Ray at his side. He was born May 17, 1926, in Newberry, Indiana, to Frank and Hazel (Pershing) Malone and they preceeded him in death. He worked on the family farm and egg hatchery until 1943 when he was called to serve our country in World War II. He joined the U.S. Army serving as a corporal in Patton's 3rd Army Division. He sailed on the Queen Mary across the English Channel to Normandy, France and walked across Omaha Beach June 7, 1944, helping to free POWs from a prison camp in Bastogne. He was honorably discharged July 23, 1946. Upon returning home, he married Betty Williams and they had a daughter Debbie who preceded him in death. He later married Judy (Boruff) Ainscough and had three children, Beth (Kenny) Hinkle of Bloomfield, Julie (Danny) Miller of Springville, and Mike (Priscilla) Malone of Odon. He worked a short time at NAD Crane, Farm Bureau Insurance and eventually Bloomfield State Bank for close to fifty years. He remained as active in the bank as he could until falling ill in December 2017. 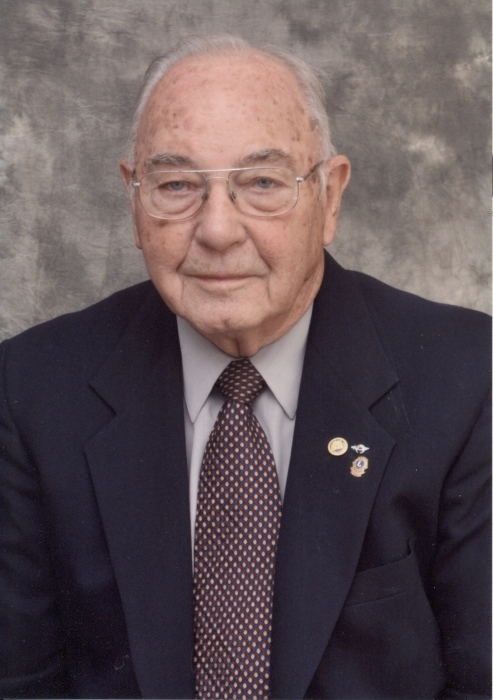 He was very active in Odon Lions Club serving as District Governor in 1965. In 2008, he was honored with the highest award a Lion can receive. The Melvin Jones Fellowship Award was presented to him for 50 years of dedicated community service. He was a member of Moore Lodge #303 F&AM and was pinned with his 50 Year Award of Gold by his son, Mike. He was also a member of Scottish Rite, Hadi Shrine, and American Legion Post 293. He served many positions in the community including Justice of the Peace in the 1960s, Odon Fire Department, Odon Town Board, Clerk-Treasurer for the Town of Odon, Ketcham Memorial Nursing Home Board, and was active on the West Boggs Park Board until 2017 helping to make West Boggs what it is today. He is survived by his children, a brother Ray (Doris) Malone of Newberry, nieces: Judy (Jim) Hunsicker of Huntingburg, Karen (Dennis) Kutch of Newberry; Grandchildren, Ethan and Miriley Malone of Odon, Kenny (Ashlie) Hinkle of Bloomfield, Heath Hinkle and Taylor Graf of Bloomfield. His niece Donna (Melvin)Lich preceded him in death. Funeral services are scheduled for 11:00 AM on Saturday, May 19, 2018 at Meng Family Funeral Home with Pastor Adam Cissell officiating. Rex will be laid to rest in Walnut Hill Cemetery in Odon. Family and friends may call from 4:00 PM until 8:00 PM on Friday, May 18 and from 10:00 AM until time of service at 11:00 AM on Saturday at the funeral home. Memorial contributions may be made to Odon Lions Club in his honor if preferred.